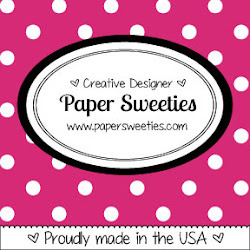 Hello, all my ribbon-loving blog friends! Welcome by today. 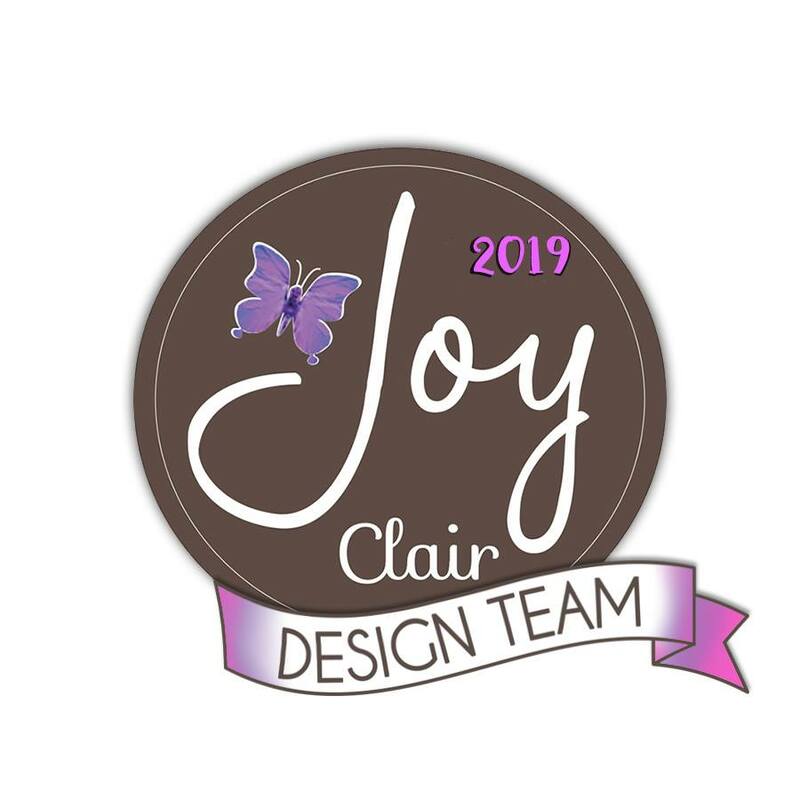 It's time for the monthly Blog Hop with Really Reasonable Ribbon, and I'm joining the rest of the Design Team to share some fun cards and crafty projects with everyone using this month's GORGEOUS Ribbon Club Assortment. 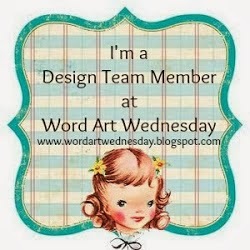 You may have arrived here by way of Bonnie's Blog (talk about inspiration, right?). 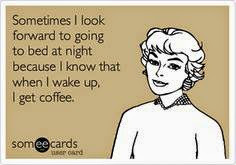 But if you didn't, you can easily catch up on the Blog Hop by stopping by the RRR Blog. Just look at the lovely jewel tones in this month's collection. 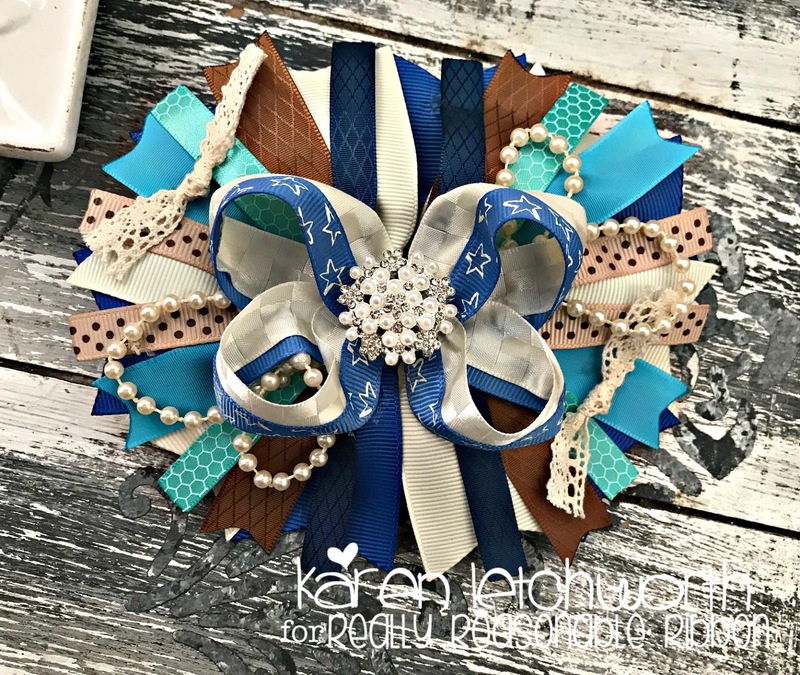 You will see blues, browns, and natural tones...and as always, each of Really Reasonable Ribbon's trims works to compliment the next. You can't go wrong combining their amazing laces, trims and twines. I'm sharing another sweet hair bow that incorporates each of the trims found in this month's assortment including a length of Natural Crochet Lace, 5/8" Ivory Checkerboard Satin Ribbon, 3/8" RRR Select Swiss Dots Grosgrain Tan With Turftan Brown Dots, 5/8" Golden Brown Diamond Satin Ribbon, 3/8" Tropical Honeycomb Satin Ribbon, 5/8" Turquoise Taffeta Ribbon, 3/8" Stars on Capri Blue Grosgrain, 5/8" Royal Blue Delicate Stitched Satin, and of course the lovely 3/8" Light Navy Diamond Satin Ribbon. Aren't they all just SO pretty together? I also wanted to mention that when I share these hair bows, sometimes I forget to include a photo of the back side of the bow; but each one is secured with a French Clip. RRR carries several different styles of hair clips and tools for Hair Accessories. 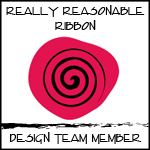 When I say, "Really Reasonable Ribbon has it all"....it's no joke...they really do! Your next stop on today's hop is at Kathy's Blog. I'm sure she's created something amazing to inspire us all. Don't forget to answer the question at the end of the hop when you're on the RRR Blog. 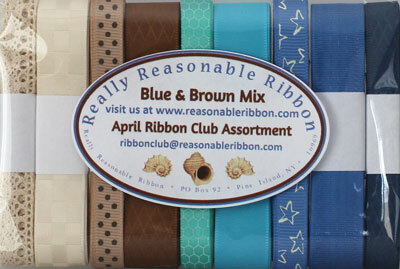 And...better yet, don't forget to stop by the RRR Ribbon Shop and treat yourself to this month's beautiful Ribbon Club Assortment, some new trims, Mulberry Flowers, Embellishments, laces, twines, and....well, Really Reasonable Ribbon has so many lovely items you'll want to try for yourself. You deserve some new goodies!! Have a great week, everyone, and thanks so much for stopping by! Wow - that's quite a hair ornament! I absolutely see it (as I see almost EVERYTHING in life LOL) as a stunning embellishment on the cover of a mini-album. Beautiful arrangement and combination of ribbons and decorations! you always manage to rock those hair bows, Karen! This is such a pretty hair bow Karen. Love it!!! WOW!! How did you do that?? What a cute idea! My granddaughter would love it. Great way to use all the ribbons, for sure. very favorites. How do you secure the hair clip? Wow! Can't believe how many ribbons you've used to create this beautiful hair adornment! Well done! Boy, you used all of them and it is stunning Karen!!! Love your work! Love this blue & brown combo! 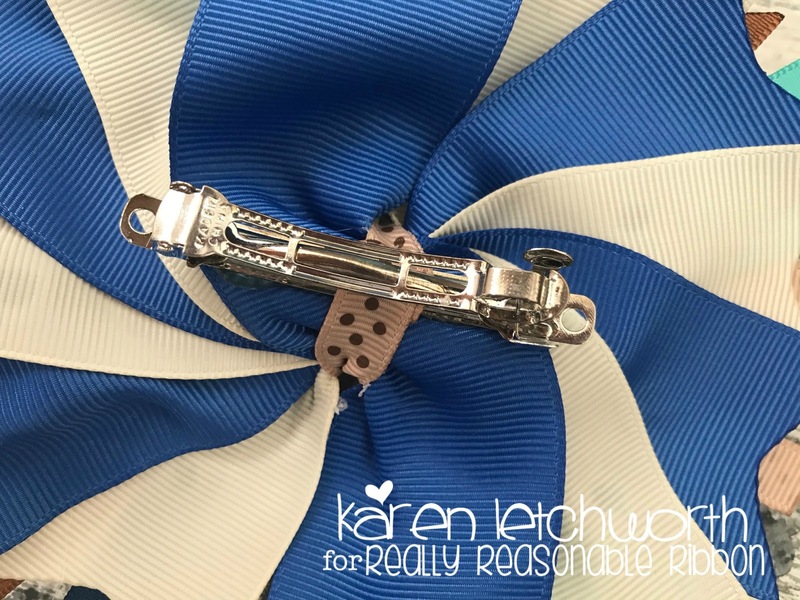 Beautiful ribbons for your hair clip! Ohh what a beautiful hair arrangement Karen - and a fabulous set of ribbons too. Love the colors of these ribbons on your lovely bow and thanks for showing the other side.